We created silver nanoparticles using silver nitrate and sodium alginate through a method of mixing and heating the two solutions. The nanoparticles were confirmed by spectrographs and electron micrograph investigations. They proved to be very effective inhibiting the growth of E.Coli when embedded in agar. Escherichia Coli (E. Coli) is a bacterial germ that inhabits intestinal tracts of humans and animals. The intestinal tract of most warm-blooded animals is colonized by E. Coli within hours after birth. E. Coli can be ingested through food and water sources. Silver nanoparticles are known anti-bacterial agents. They are effective in combating E. Coli, as well as other forms of gram-positive and negative bacteria. Scientists are currently producing silver nanoparticles through many methods; we were successful in producing nanoparticles by a method reported by Raut, R et al., using green tea and silver nitrate. ((Raut Rajesh W., Lakkakula Jaya R.1, Kolekar Niranjan S., Mendhulkar Vijay D. , Kashid Sahebrao B., “Phytosynthesis of Silver Nanoparticle Using Gliricidia sepium,” Current Nanoscience, , 5, 117-122, 2009)) We came up with a method using sodium alginate and silver nitrate. We first produced nanoparticles using two different concentrations of AgNO3, 1.0 mM and 2.0 mM. We heated the solutions using a microwave and a hot plate. The hot plate with a 1.0 mM AgNO3 was more successful (see spectrograph). A possible reason for this is consistent heat flow. The characteristic absorbance of 420nm is observed ((Raut Rajesh W., Lakkakula Jaya R.1, Kolekar Niranjan S., Mendhulkar Vijay D. , Kashid Sahebrao B., “Phytosynthesis of Silver Nanoparticle Using Gliricidia sepium,” Current Nanoscience, , 5, 117-122, 2009)). Silver is a known bactericide. Nanoparticles have been previously used to inhibit the growth of E. Coli ((Raut Rajesh W., Lakkakula Jaya R.1, Kolekar Niranjan S., Mendhulkar Vijay D. , Kashid Sahebrao B., “Phytosynthesis of Silver Nanoparticle Using Gliricidia sepium,” Current Nanoscience, , 5, 117-122, 2009)) ((Ki-Young Yoon, Jeong Hoon Byeon, Jae-Hong Park and Jungho Hwang, "Susceptibility constants of Escherichia coli and Bacillus subtilis to silver and copper nanoparticles," Science of The Total Environment, Volume 373, Issues 2-3, 15 February 2007, Pages 572-575)). The materials used to create silver nanoparticles will be 200mL distilled water, .170g AgNO3, .500g sodium alginate (food grade sodium alginate - Algin - Cuisine-tech CT1000 Paris Gourmet, Carlstadt, N.J.) , a microwave, and a hotplate. The first step will be to prepare 100mL of .010 M AgNO3 by adding .170g of AgNO3 to 100 mL of distilled water. Then create a 100mL of sodium alginate solution by adding .500g of sodium alginate to 100mL of distilled water. Next prepare 1.0mM AgNO3 samples by adding 2.00 mL of AgNO3 solution to 18 mL of alginate. Also 2.0 mM of AgNO3 samples were prepared by adding 4.0 mL of the AgNO3 solution to 16.0 mL of the alginate solution. The next step is to heat the solution. Bring the 1.0 mM AgNO3 sample of alginate to a boil on the 5 setting of a Corning model PC-420 hot plate, keep the boil for one minute. Or heat 1.0 mM AgNO3 samples of alginate and 2.0 mM AgNO3sample in a Sharp Carousel 1200 watt microwave for 20s then stir. Then heat in 10s pulses and stir for a total of 60s of microwave time for each sample. This is when the nanoparticles are formed and will be referred as the silver nanoparticles. The materials used to make the agar are (10) petri dishes, 250mL flask, a marker, 5mL of silver nanoparticles, 100ml distilled water, 4g of Lysogeny broth (LB) agar (recipe for LB was formulated by Giuseppe Bertani), a graduated cylinder, and a microwave. The first step in creating the agar will be to mix 4g of LB agar with 100mL of distilled water in a flask. Then microwave the flask and contents for 30 seconds and then swirl. Continue this step until the solution comes to a boil. Then let the solution cool for 5 minutes. Next pour 10mL of the solution into 5 Petri-dishes. Then mark 5 different petri-dishes with a black marker. This mark will indicate which dishes have silver nanoparticles. The next step will be to add 5mL of silver nanoparticles to the remaining 50 mL of agar solution. Heat the solution in the microwave for 20 seconds and then swirl. Then pour 10mL of heated solution into 5 marked Petri-dishes. Finally let all of the dishes sit over night. The materials used to culture the E. Coli will be agar dishes (previously prepared), E. Coli, inoculation loops, and gloves. First dip the inoculation loops into E. Coli. Then remove the cover from the Petri dish, making sure to place it face down on the table. Next gently streak the dish cover about half the circle, then rotate the dish and repeat until the Agar is thoroughly covered. Then Place the cover back on the dish and set it aside. Finally dispose of the inoculation loop. Continue doing these steps until all the plates have been cultured. Our method of reacting silver nitrate and sodium alginate to form silver nanoparticles was successful as confirmed by the spectrographs and the electron micrographs. The agar embedded with our silver nanoparticles mixture inhibited all growth of E. Coli. Ki-Young et al. reported a maximum threshold of .0236ml/mg, this converts to 42 mg/mL. Our preliminary threshold is below .0053 mg/mL. Our experimental threshold proved to be significantly lower than those previously tested. 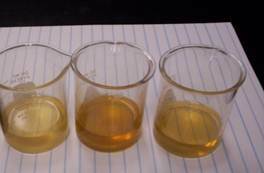 However, we did not test for Ag+ in the system and our calculation is the final amount of silver in the agar. Further study is needed to confirm this threshold level. Therefore, this experiment is noteworthy, because our method of creation is simple and easily accessible for further classroom study of silver nanoparticles. Inderscience Publishers. "Antibacterial silver nanoparticles are a blast." ScienceDaily, 25 May 2010. Web. 28 Oct. 2010. Hello. My name is Cathleen and I am wondering if you could help my partner and I with a research project that is very similar to yours.